It’s the most wonderful time of the yeeeeeear! You guys, this is the biggest sale I’ve ever had! I really wanna clean out my shop and make room for some new designs and pieces. Oh, and I forgot to mention in the pic – FREE shipping for the rest of 2018! Everything in my shop is on sale, from 20% up to 40% and I’m so excited to see what else on Etsy is getting deep discounts. It’s gonna be a huge event, so get ready to get your shopping on!!! I had a bit of brainstorming and made a pretty cuff out of 4mm cubes in a simple peyote cuff. Then a few months later I did some herringbone with 8/0 hex beads. Aaaaaaand then I didn’t touch the giant spool of 20lb Fireline for four years. Oops. But here I am again and I wanted to fill you in on a few more things that I’ve recently managed to use that super stiff thread to make. First off! I have discovered that after making a bunch of beaded carrier beads, 20lb Fireline is a great way to string them into a necklace! It’s a thread, so I don’t have to worry about all that crimping nonsense, but it has virtually no slack and lends itself to the stiffer beaded needed to get that nice curve. But just recently I made a long-chain version with some Delica bead soup I whipped up! The 20lb Fireline kept that curve nice and tight, which I appreciated. A few months before that, I fell in love with this Czech glass button and decided to make a turquoise and gold version of my Stash Worm Bracelet to match. I needed to use normal 6lb thread for the embellishments, but for the square stitch base, I used this crazy thick thread and ended up needing to make fewer passes. My next project is to take all the leftover DiscDuos and Honeycomb beads that have been left extra after my assorted Demoiselle bracelets. I’ve been saving them up and now I’m gonna string them on my monster Fireline with Toho Demi beads and drop beads to make a wrap bracelet. I haven’t finished it, but I’m excited to use up these extras and make something pretty! Slowly, but surely, I am finding ways to use up this crazy stiff, annoyingly thick, can-only-be-used-with-a-Big-Eye-Needle gosh-darned thread. Do you guys have any more ideas for me? Someday, I will defeat this spool! We’re back at it with our clasp war series, where I talk about the pros and cons of different types of clasps and my suggestions for using them. Today we are talking about a real classic – buttons! So, first off, the obvious bit – buttons are freaking gorgeous and there are so many kinds! Below this paragraph, I have photos of two of my Stash Worm bracelets. The one on the left has a fancy Czech Glass button that I purchased at my local bead shop and the the one on the right is a random button I found in an old sewing kit. The color-matching and style possibilities are endless and the variety of aesthetic options means that you can always find the perfect button to add something special to your piece. Buttons never just look like hardware – they’re always a design element. Another great thing about button is that you can find them anywhere. You can pick up unique vintage pieces at garage sale or find hand-carved wooden ones on Etsy. You can pick something loud to build a piece around or something simple to blend in. Because so many different crafts use buttons, you aren’t limited to what bead manufacturers put out. Buttons are everywhere and you’ll never hurt for options. For me, this is the big issue I have with buttons – they can be hard to attach. For one thing, you gotta figure out what size to make the loop so that it fits over the button easily, but isn’t so loose that you risk the bracelet falling off. You basically have to use trial and error and that can be annoying – and all the stitching, un-stitching, and re-stitching can even start to fray your thread. It can be frustrating. You also need to take into account that your loop can make your bracelet look lopsided if your button on the opposite side is snug up against your beading. In my SuperDuo Rosette bracelets below, I left some space between the button and beading so that when the bracelet is clasped, the button looks centered. It seems to solve the problem, but it takes a little more forethought than you would usually need for your clasp. The other issue with buttons is that they can be hard to fasten if the loop is tight. The orientation of the button can make for some weird wrist maneuvering when trying to fasten by yourself. Personally, I don’t think it’s a huge challenge, but if you usually use, say, magnetic clasps, the inconvenience will be noticeable. So, generally I use buttons for bracelet clasps because it’s a bit less secure than I prefer for a necklace. It can be a bit fussy to make sure the loop is the exact perfect size for the button, but if you manage it, the added element of style and seamless blend between clasp and beading can be really hard to beat. I love it when a clasp doesn’t look like hardware. What do you guts think? Do you use buttons? Have any tricks for figuring out the loop size for each one? I’d love to hear your thoughts, so pop a comment below if you have anything to add! In my last post, I revealed my SuperDuo Rosette Bracelet update. Since I’ll be teaching it at my LBS next month (Beaded Bliss on October 13th, if you’re in the Cincinnati area! ), I wanted to make a new bracelet to leave as a sample. So, I made a big mix of autumnal colors (I think there’s at least 12 different colors in this mix – it’s absurd) and made this bracelet. Fun, huh? I really liked the color mix – which is good, because I had SO much left, you guys. Like, more than 20 grams. So, I started stitching up a peyote band. I figured that would use up most of the pile and I ended up with this simple beauty. The plain peyote really let the color mix shine! BUT I still had so many beads left. I decided this time to do my SuperDuo Fishtail bracelet which is basically a single column of never-ending herringbone. I thought I could probably get a double or triple wrap bracelet out of the pile I had left. It was so long that I had to make it into a necklace, haha. When I make bead mixes, I make TOO MUCH. Everytime. The gorgeous glass circle is by Thornburg Bead Studios and the leaf dangle is by Leslie Watt. I was so lucky to have them waiting in my stash to match my necklace chain. So, what do you guys think? Have you ever gotten stuck with an accidental overly-ambitious bead soup? Do you have go-to patterns for eating up excess beads? Let me know in the comments! It’s time once again for another Clasp Wars post! I ran another vote on the Wescott Jewelry Facebook Page for what clasp you guys wanted to talk about next and though it was close, the good ole slide clasp just barely eked out a win! So, first off! One of the most advantageous things about slide clasps is that they are incredibly slim. This is great when you don’t want to add a lot of length to your project. It’s also great if your piece is flat and you don’t want your clasp to disturb the low profile. I made this piece for a challenge – read about it here! Slide clasps come in lots of different lengths. I usually use the two or three loop variety, but I’ve seen ones as long as nine loops. Regardless of how wide your bracelet is, you should be able to find a corresponding slide clasp with enough loops for a secure connection. 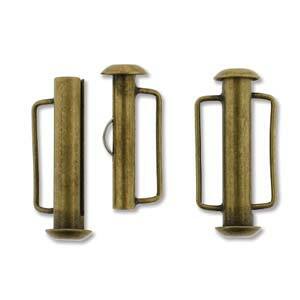 Slide clasps are also available in a variety of color and metal finishes. My favorites are the matte antique-y ones, like the matte silver below, but they coming in bright finishes as well. You can also get sterling silver, if that’s your jam. I have found in the past that connecting them was a bit annoying. They were always perpendicular to how I was stitching, so I had to use jump rings to attach them or do some weird stitching to get bulky loops where I wanted them. But now they make slide loops with vertical loops! I don’t have any photos of jewelry made with them, since I just found out about them recently – but I am very excited to play with them in the future! You can also get them in a plain bar style, which is perfect for peyote stitch! I’ve used something like these once or twice, but I don’t do plain peyote stitch often enough to keep a huge supply on hand. I’ve also found that slide clasps are a good blend of secure and easy to use. Some of them are a bit magnetic, but the main mechanism to keep them closed is with a little tension doo-hickey in the center. Since the slide goes vertically and most sudden tugs on the bracelet will be horizontal, it tends to hold up well against stress and doesn’t break easily. Honestly, there aren’t a lot of disadvantages to this type of clasp, but one thing I don’t love about them is that they’re a little plain looking. Adding pretty twisted jump rings can help and some times the simplicity of the clasp works better with the design, but I’ll admit, the look isn’t my favorite. Another to note is that sometimes a customer won’t know how to use a slide clasp if they haven’t seen one before – it’s not always super intuitive that they slide out vertically. This is not at all a problem if you’re selling your jewelry in person, since you can just show them the magic, but if you sell online, it can be a little tricky to describe the motion through text. I only use slide clasps on bracelets. They might work on multi-strand chokers, but I rarely make multi-strand necklaces and find them a little fussy to work with behind one’s neck. I use them on bracelets where I need the clasp to add as little length as possible, where the design calls for a slim, simple finish, or I’m making something particularly wide or flat. I’ll admit, I used to use slide clasps more before I started keeping a stash of box clasps on hand. Nowadays, I don’t find myself as drawn to the simple, utilitarian style. But I have used them lots in the past and I consider them a useful staple in my stash. Details on this bracelet can be found here! So, do you have anything to chime in? Comment below if you have any thoughts about slide clasps! Do you like them? Use them a bunch or never tried one out? I wanna know! Stay tuned for more Clasp Wars and other posts – and check out my Facebook page for when I post my next poll on what type of clasp to examine next!